Yay, polka dots! 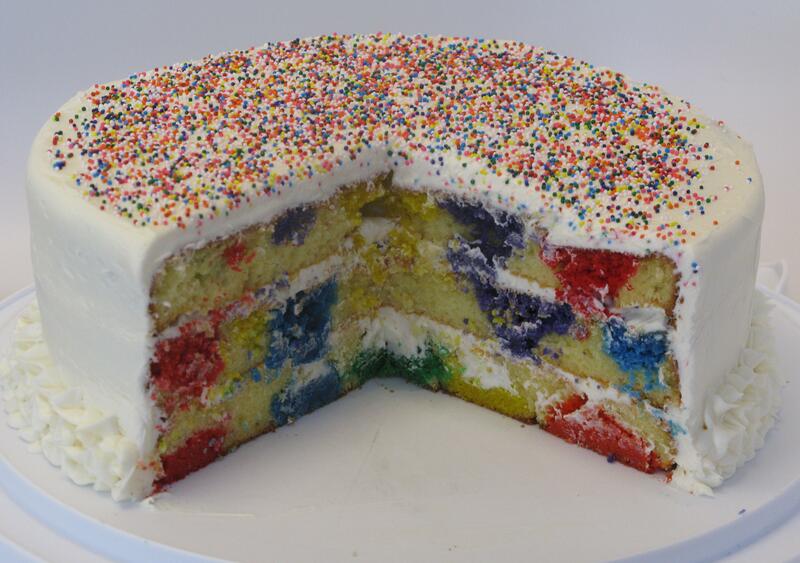 My sister-in-law actually sent me a link of a cake that was baked with polka dots. She claimed that her kitchen might blow up if she attempted this, but thought I would be interested. Heck yeah, I was. 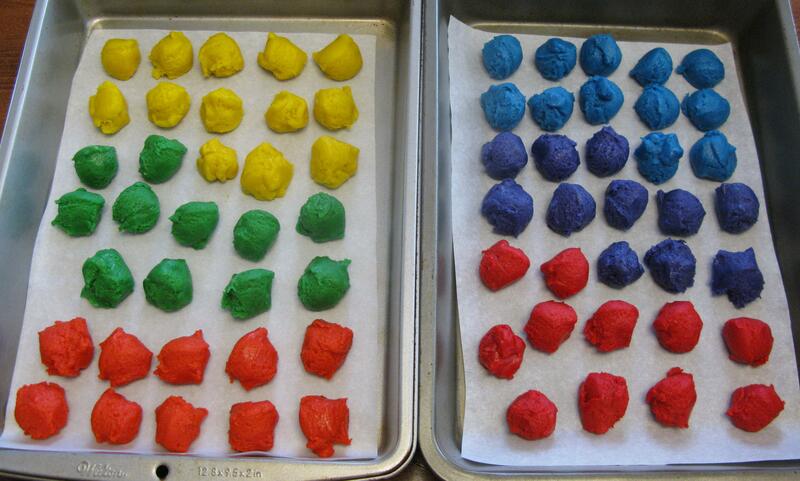 When I clicked on the link and saw that the original idea of this was created with different colors cake balls that were already baked and then put inside the cake to be baked again, I wanted to do something different. In my chocolate chip cookie cupcakes, I bake an entire chocolate chip cookie inside each cupcake. 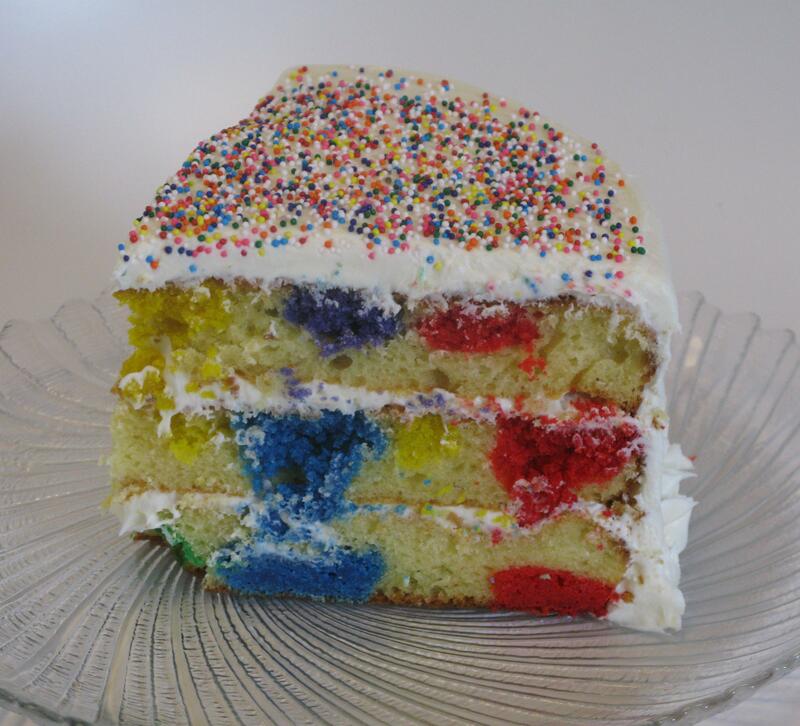 Those things are so delicious, that I decided to try it out this way with a cake, but with the polka dot concept. First, I took the easy route and bought two of the pre-made sugar cookie packs of cookie dough at the grocery store. 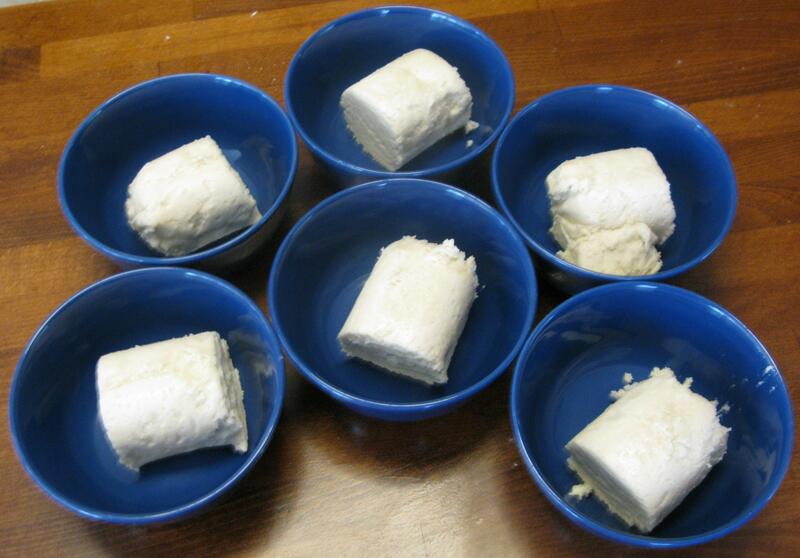 I cut them up into six pieces and let them soften. 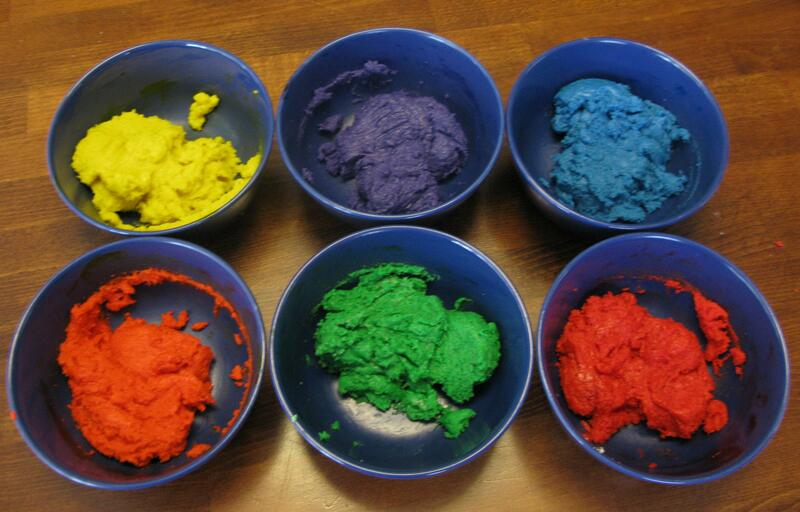 Using an electric mixer, I colored each little batch of cookie dough. With a mini cookie scoop, I distributed the cookie dough so that all of the dots are approximately the same size, then put them in the refrigerator to slightly harden before rolling them into balls. 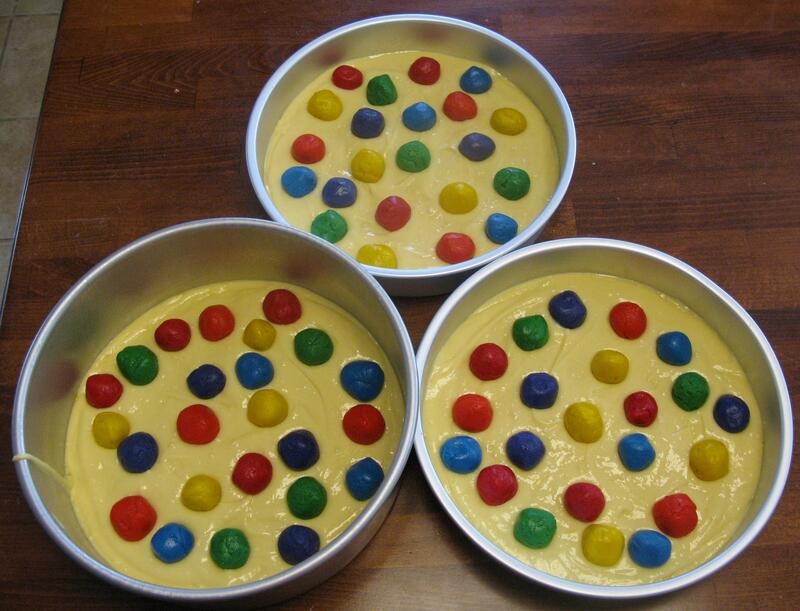 I made the cake batter, then rolled each little scoop into a ball, and placed it on top of the batter in the pans. I used 3 10-inch pans. The finished product! 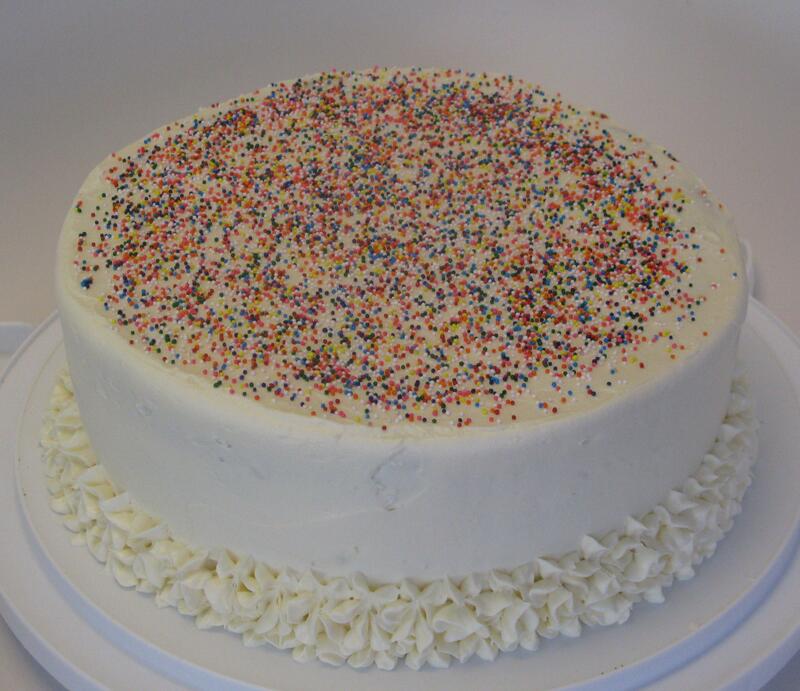 I went a little crazy with the colorful sprinkles, simply because I liked all the added color. For the icing, I went with cream cheese on this particular cake. No reason other than the fact that I love cream cheese icing, but you can use vanilla with this cake as well. Bake in oven at 350 degrees for about 30 minutes, or until sides of cake slightly pull away from pan and the top is a light golden brown. Look at all of those beautiful colors! Make sure you don’t over cook the cake, because then the cookies will be a little harder to cut through when serving. Ohh, that’s a big chunk. Yes please, I’ll take that one. Combine all ingredients and mix well at medium speed for 2-4 minutes. Spoon into cake pans and bake for 25-30 minutes, or until tops of cake are a light golden brown and slightly pulling away from sides of pan. Sit pans on cooling rack and cool for 12-15 minutes, then turn out of pans onto cooling racks, cool completely before icing.